Historian Paul Monod unraveled some of the mysteries surrounding the museum’s two 15th-century Flemish panel paintings for an admiring audience of art aficionados on February 28. The exquisite paintings on wooden panels are attributed to the “Master of the St. Ursula Legend,” an unnamed artist working in Bruges between 1475 and 1500, and are currently on view in the museum’s Cerf Gallery. Read the full Dispatch on the Middlebury Magazine blog. 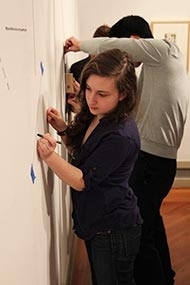 Students in Edward Vazquez’s spring course “Minimalism: Art, Objects, and Experience” finished recreating Sol LeWitt’s Wall Drawing #394 in the museum’s Overbrook Gallery this week, and Middlebury Magazine was on hand to produce a great short video about the process. The First Commandment for museumgoers — thou shalt not touch — has been suspended this week for 13 Middlebury College art-history students. They’re drawing with crayons on a wall of the college’s Museum of Art. What would usually be considered totally transgressive behavior is actually an essential act in regard to the centerpiece of a show titled “Linear Thinking: Sol LeWitt, Modern, Postmodern and Contemporary Art from the Collection.” The students in Middlebury professor Edward Vazquez’s course on minimalism are completing a LeWitt wall drawing in accordance with instructions from the artist’s estate. Read the full story in Seven Days. “Looking at the photos, you might decide they reflect the scarring of a gorgeous landscape. 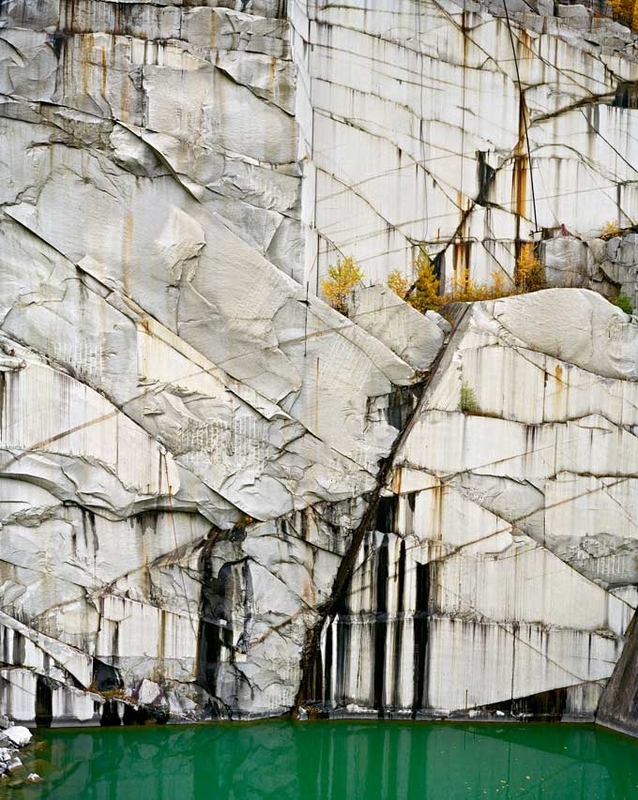 You might also be struck by the sharp color and dramatic angles Burtynsky extracts from the quarries and tell yourself he’s not showing a scarring of the landscape, but instead he’s pulling back the curtain to reveal Vermont’s inner beauty. Stare at the photos long enough and you’ll probably bounce between those two views several times.” Read the full story in the Burlington Free Press. 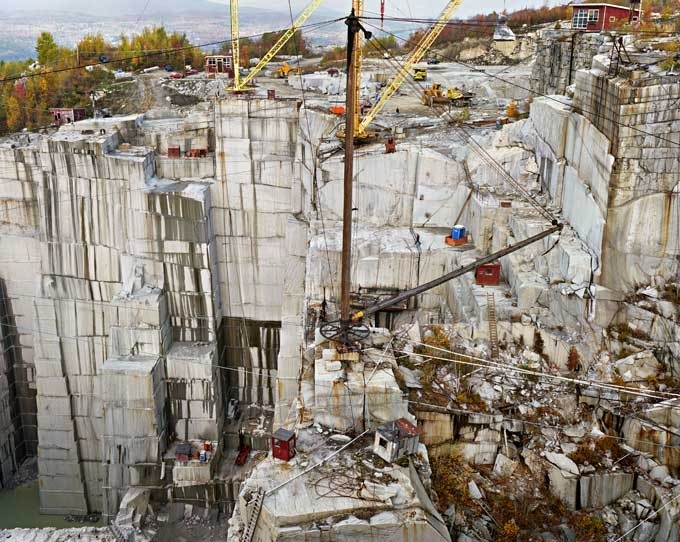 In February the Middlebury College Museum of Art will open Nature Transformed, an exhibition which takes as its starting point a remarkable series of photographs by pioneering, internationally celebrated artist Edward Burtynsky. 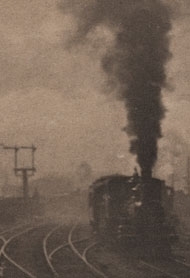 The show, which was previously mounted at the Hood Museum of Art at Dartmouth College, will be on view through June 9. On the occasion of this year’s national presidential election the Middlebury College Museum of Art has mounted an exhibit of twenty political cartoons—and one bronze sculpture—created by the noted political cartoonist Patrick Bruce “Pat” Oliphant (b.1935). The exhibit features ten caricatures, acquired by the museum in 2010 and never previously exhibited, which provide historical insight into issues that preoccupied Americans during the thirty-sixth through forty-third presidencies—i.e., from Lyndon B. Johnson to George W. Bush—as well as ten caricatures pertaining to the current election which are on loan from the artist himself. In honor of the recent visit by His Holiness the 14th Dalai Lama to Middlebury and to celebrate Vermont’s connection with Himalayan culture, Middlebury College is hosting an exhibition of contemporary Tibetan art. Contemporary Jewels: An Offering presents eleven works by five artists of Tibetan heritage—Tenzin Norbu, Dorje Sherpa, Tsherin Sherpa, Tenzing Rigdol, and Palden Weinreb—all of whom were granted residencies at the Vermont Studio Center in Johnson. 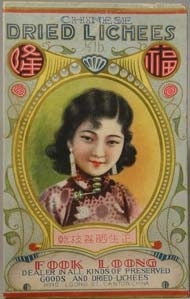 On September 13 the Middlebury College Museum of Art opens China Modern: Designing 20th Century Popular Culture, an in depth exploration of 20th century Chinese advertising images, mass media, graphic and product design that demonstrates how political ideologies and cultural values are transmitted through everyday objects.